After years of painting medieval figures for DBx and now FOG I thought I'd try something a bit different. So here we have my first attempt at some 15 mm WWII figures from Peter Pig. Over size photo. Click for enlarged, "warts and all", photo. At Vapnartak I bought a 8th army mortar platoon and some T34s so I could try a range of different colour schemes. I've not touched the tanks yet but I have stared the mortar platoon. I tried a very different approach to these figures mainly because I was shocked at both the detail and small size of the Peter Pig figures. They are a true 15 mm not the 17 or 18 mm that has become standard in the major medieval ranges. I was surprised at how much research I needed to do. I used the Artizan Designs guide in the beginning and later I found the Flames of War guide which helped with a few of the smaller details. As a colour trial, out went the black undercoat! I used a burnt umber wash over my usual dark grey primer. I then painted the uniform and webbing leaving only the deeper shadows remaining. I then washed with Vallejo smoke diluted with matt medium. The figures really did take the wash very well. 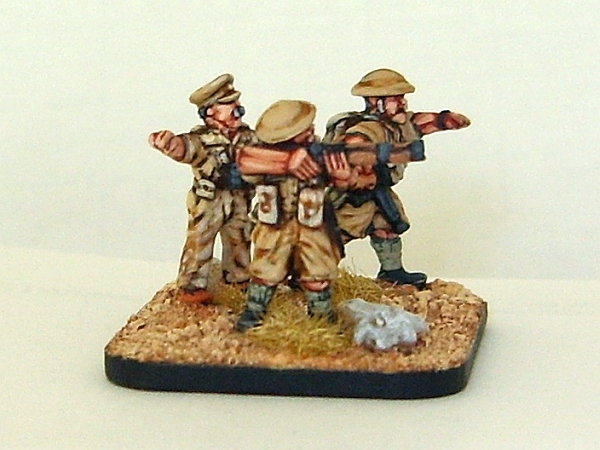 This was followed by a painted highlight in the original base colour. Finally, I painted the flesh, weapons and boots. I tried something different with the basing scheme and I'm pleased with how it turned out so I'll probably stick with this scheme black edge and all. One thing I found that helped was dry brushing the static grass very lightly with the final base highlight; it really helped blend the elements of the basing scheme together. Of course the true test will come when I try and replicate this standard when painting in batches. The plan is to do the half a dozen observer figures in one batch before tackling the six mortar teams in one final batch.